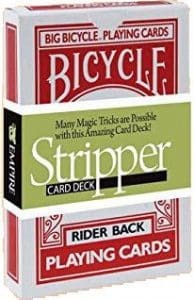 Trick Decks Every Magician Should Own - Even the Pros! Trick decks are NOT a replacement for essential sleight of hand skills. 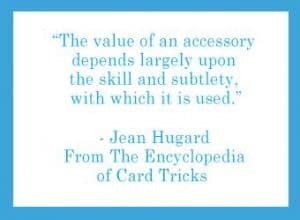 Did you know that pretty much every professional magician – even the ones famous for sleight of hand – use a ‘special’ deck every now and again? And contrary to popular belief, trick decks are NOT self-working. They require just as much practice, rehearsal and attention to detail as any other sleight in your repertoire. In conjunction with even a little sleight-of-hand, though, using a trick deck at exactly the right moment can turn a beautiful magic show into a piece of art capable of completely transporting the audience to the realm of miracles. 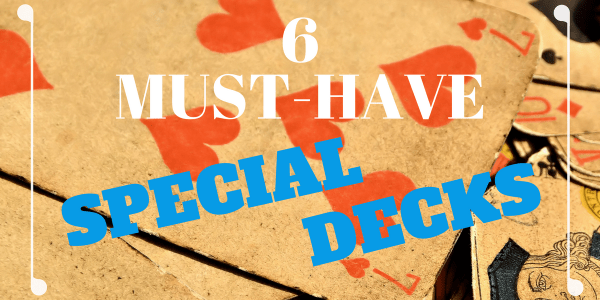 There are so many trick decks on the market today – and so many forgotten but amazing ones – we thought we’d share a list of our 6 favorite ones with you. Keep in mind that many special decks can be used for the same thing, like forcing a specific card, for example. In order to decide which deck is best for a specific trick you want to perform, plan on experimenting a bit. You’ll soon decide which deck works best in any given situation for your personal style. As always, we welcome your comments and suggestions at the bottom of this post! Often called the Invisible Deck (though that is actually a presentation), the Ultra Mental trick deck is one of the most versatile decks to carry with you. It never disappoints and can help you out of many sticky situations. With this deck, at a moments notice, any card can be shown to be the only face down card in an entirely face up pack. The space this special deck leaves for creativity is astounding. It can be performed in close-up, parlour or stage, and it’s always strong enough to ‘steal the show’! 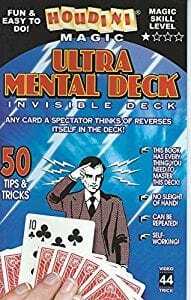 Whether you use the traditional Invisible Deck presentation, or endow your spectators with powers that make the magic happen… or even give the cards themselves magical abilities, the Ultra Mental Deck is ALWAYS a hit. You can even combine it with a chosen card from another pack to create the ultimate prediction. With the Ultra Mental Deck, you really do have unlimited possibilities. In fact, we’d love to know: what is YOUR favourite way to present this effect? As one of the most versatile trick decks out there, it’s no surprise that thousands of Svengali Decks make their way into the hands of magicians every year. 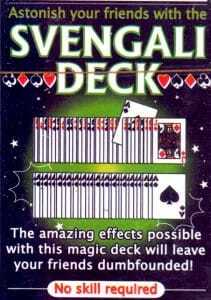 In fact, the Svengali Deck is the most common trick deck there is – and it’s sold, or ‘pitched’ in magic stores, stands and by street performers all around the world. If you meet a person who’s bought a trick deck of cards before, it’s likely it was a Svengali Deck. For that reason, many non-magicians are familiar with the principle of this deck, however, don’t let that deter you. Use the Svengali Deck carefully and no one will have a clue. This is especially true if you ‘ring in’ your Svengali Deck using one of the many deceptive deck switches favored by clever magicians. You can use the Svengali Deck to force one or two specific cards, have a chosen card appear anywhere in the deck or even perform a ‘card stab’ to allow you or your spectator to locate the ‘selected card’ every time without fail. We love to use the Svengali Deck as an incredibly clean card force. Once your spectator is convinced they’ve had a free selection, you can perform a wide variety of card locations. The force made possible by this deck is so clean and convincing, you can perform an astounding ‘card to impossible location’ simply by embedding a duplicate of the force card in a piece of fruit. For a self-working card trick, it just doesn’t get any more amazing that that! Second Sight is a classic effect that’s just as strong – if not stronger than – the Invisible Deck. 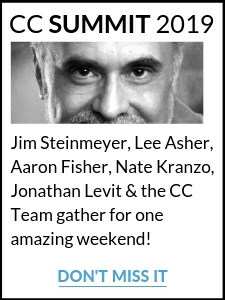 Ending soon… receive our 8 Video Training Plan AND easy training on the simplest ways to make your own tricks decks…all for just $7. Be Smart. Get Second Sight now, before it vanishes. The Stripper Deck, often called Wizard Deck, can be used for a plethora of effects; mind-reading and predictions all the way to card through handkerchief and rising cards. Imagine this: a card is freely selected and replaced in the pack. You cleanly cut the cards and ask that the chosen card be named out loud, to reveal that you cut EXACTLY to the chosen card… before you even knew it’s identity! The Mene Tekel Deck is a hidden gem in the world of trick decks. It can be used to create miracles that are impossible to duplicate using sleight of hand alone. You can use the Mene Tekel Deck to discover the identity of a freely selected card. You can have the selected card appear in your pocket, in a hat or in virtually any location you can think of! Or, picture this: the spectator selects a card from a blue deck, which is shown and placed aside. Then a card is freely selected from a red deck, and revealed to match the first card exactly! 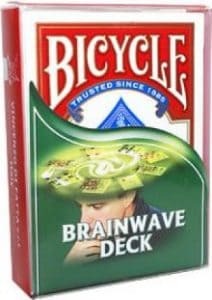 The Brainwave Deck makes for a wonderful ‘Invisible Deck’ Presentation… but with a surprise ending. Not only is the chosen/thought of card reversed in the deck, it is also the ONLY card which has a different colored back then the rest of the cards in the deck! A good quality Marked Deck can allow you to perform card tricks that create the experience of real magic. Just by looking at the back of the card, you’ll know its exact identity. With this information, you can read minds, make shockingly accurate predictions and know exactly what card your spectator has chosen the moment it’s removed from the deck. Armed with a marked deck, you can have an amazing opener, middle or closer. Used skillfully, this kind of trick can be used to create miracles.